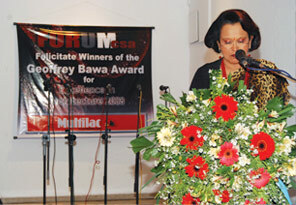 Forum CSA felicitated the winners of the Geoffrey Bawa Award for Excellence in Architecture 2008 with Excellence in Music against a Spectacular Pallet of Colour of Multilac that vibrated throughout the evening at the Barefoot Café on the 19th of September 2008. The Geoffrey Bawa trust announce the winners of the first ever coveted Geoffrey Bawa Award for Excellence in Architecture 2008 at a formal and prestigious ceremony at the Galle Face Hotel to honour Deshamanya Vidyajothy Geoffrey Bawa’s 89th Birth Anniversary. This was the first time that a competition of this nature was conducted in Sri Lanka on par with International standards as that of the Agar Khan Award for Excellence in Architecture, using a two stage evaluation process that was conducted by a distinguish panel of judges. Of the large number of entries received nine were short listed and a thorough physical evaluation was carried out before choosing the winners. Two tied for the first place, Lalyn Collure for Bolder Gardens Hotel and Shyamika Silva for the Indrasena House, Commendation Awards were secured by Nela de Zoysa for the Suzuki Maruti Complex and Palinda Kannangara for the Estate Bungalow at Ginigathhena. Forum CSA the allumnai of The Colombo School of Architecture felicitated the winners for bringing credit to The Colombo School of Architecture. Multilac celebrated this event by sponsoring this distinguish gathering of past presidents of The Sri Lanka Institute of Architects and members and guests of The Forum CSA also present were The Hon. Patron of Forum CSA Prof. Lal Balasuriya a past president of the SLIA, Archt.Rukshan Widyalankara Immediate Past President, Archt. 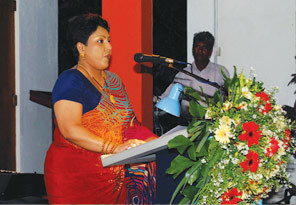 Chandana Edirisuriya President Elect, Archt. Prasanna Silva Director CSA & Archt. Asoka Widanapathirana Immediate Past Chairman of The Board of Management of CSA were present. Past President Dudley Wass, current Chairman of the Board of Management of CSA was chosen to give away the tokens of appreciation from the CSA to the winners due to his untiring efforts in nurturing The Colombo School of Architecture for 13 long years. The award winning projects were projected on a screen while the winners were felicitated to the sounds of Soundare David and award winning Sole Sounds to the extra ordinary voice of Rohan De Lanorol. 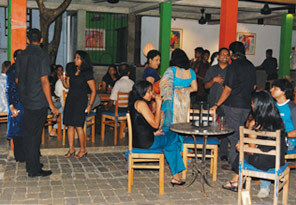 Neranjan De Silva joined the musicians with his excellence sound. Multilac was proud to be a partner in Excellence in Architecture, music and colour.